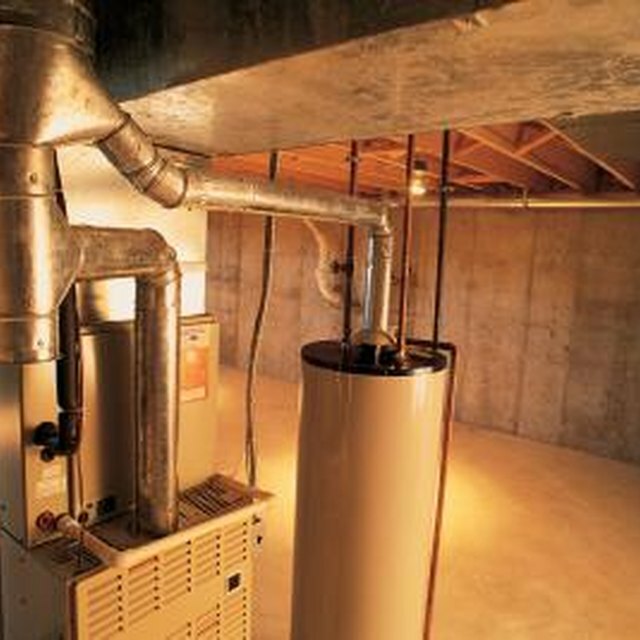 The vast majority of home heating systems take the form of furnaces and boilers. Fuel powers a heating element, which raises the temperature of the air being channeled through the furnace with the help of fans. High efficiency models provide the most amount of heat with the least amount of energy use. Replacing an older, inefficient furnace with a newer model can save hundreds of dollars over the life of the unit. Furnaces are rated based on their efficiency. Gas furnaces are judged by the annual fuel utilization efficiency rating (AFUE). The AFUE is the rating of how much gas or electricity consumed by the furnace is converted to heat. It also measures the value of the heat produced from the natural gas. Furnaces with a 90 percent AFUE convert 90 percent of fuel consumed to heat, as well as providing 90 cents worth of heat for every dollar spent on fuel. Highly efficient furnaces are defined by the US. Department of Energy as having an AFUE rating of 90 percent or higher. This class of furnaces has a sealed combustion area, trapping extra heat for circulation. According to "Consumer Reports," high-efficiency furnaces cost upwards of $1,000 more than a lower efficiency model, but the fuel savings make up for the upfront expenditure for homes in the colder Northeast and Midwest regions of the United States. Compromising cost for efficiency leads to furnaces in the 80 percent AFUE range, the lowest acceptable rating for a fossil-fueled furnace. Mid-efficiency furnaces use electronic ignition to start heating, but lack the sealed chamber to trap the heat caused at combustion. The lesser efficiency, lower cost units shift the expense from the purchase price to monthly energy bills. High-efficiency models and the best mid-efficiency furnaces have two important features. Variable speed blowers control the amount of heat distributed through the structure, producing less noise. They are also less susceptible to drafts and heat loss. Dual heat exchangers utilize two intake areas to draw the maximum amount of heat from the combustion area to heat the air distributed through the house. The US. Department of Energy's Energy Star program rates furnaces based on efficiency and energy savings. To qualify, furnaces must have a rating of 85 percent or better and have highly efficient blower motors built in. Depending on the tax year, income tax credits may be available for buyers of Energy Star-rated furnaces. What Is the Typical Efficiency of a Coal Boiler?